Discussion in 'Outerwear' started by VestCoast, Apr 15, 2019 at 10:51 PM. I ordered this Aero D-Pocket Ridley off the Thurston Bros featured stock page a little less than a week ago and got it in the mail today. 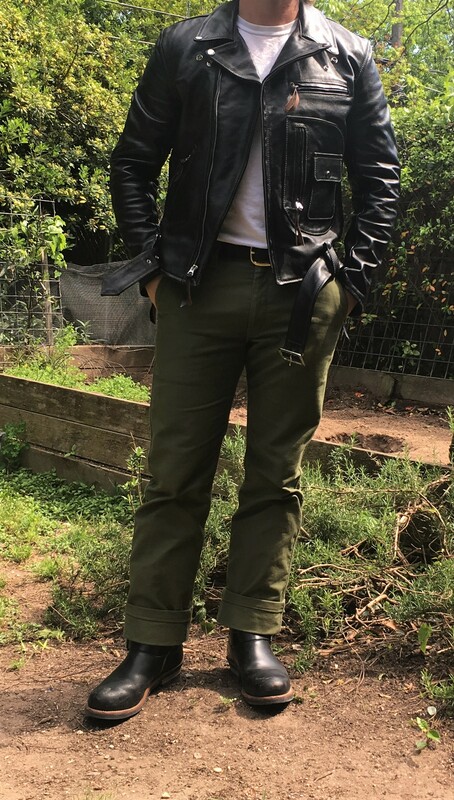 I was hoping to get some feedback on the fit/appearance. 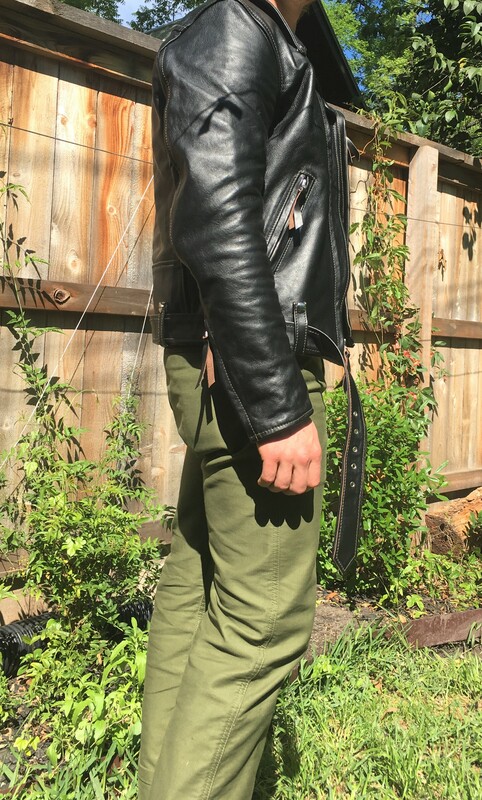 I am leaning towards keeping it, I'm really happy with the lighter weight leather and lining--it extends wear time significantly here in Texas. This is my first experience with Vicenza leather and I have been intrigued by the blackened brown for some time. There seems to be very little information on its evolution/aging so if I keep this jacket I'll hope to update in this thread. I'm very happy with the measurements, the body and sleeve length are pretty much where I would have ordered them if I went custom. It's got a little more breathing room than my Sheene, both size 40, but it's most likely due to the leather. It's pretty snug across the shoulders, but I have more mobility than in the Sheene. I think this jacket will break in quite nicely, giving me a little more range of motion. 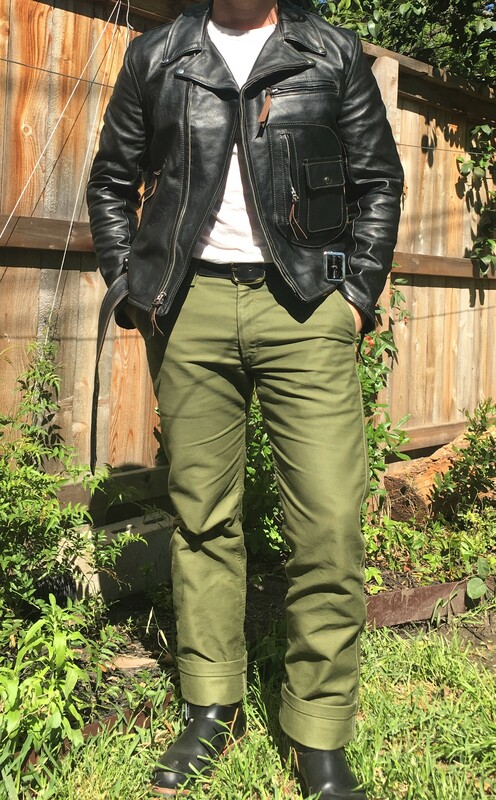 The work pants I am wearing in the photos have a generous rise, but it's representative of the jeans and pants that I wear normally. 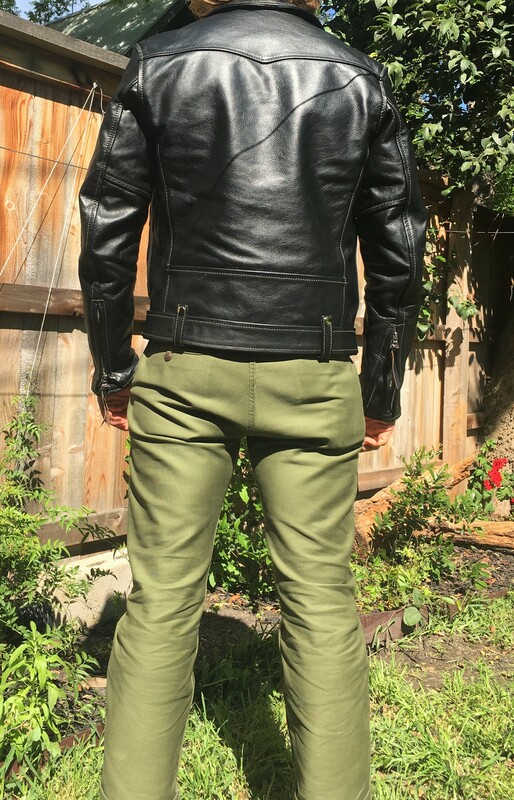 The belt I have on in the photos lies pretty much exactly underneath the jacket belt, which I think looks good but may introduce accelerated wear at the waistband lining. 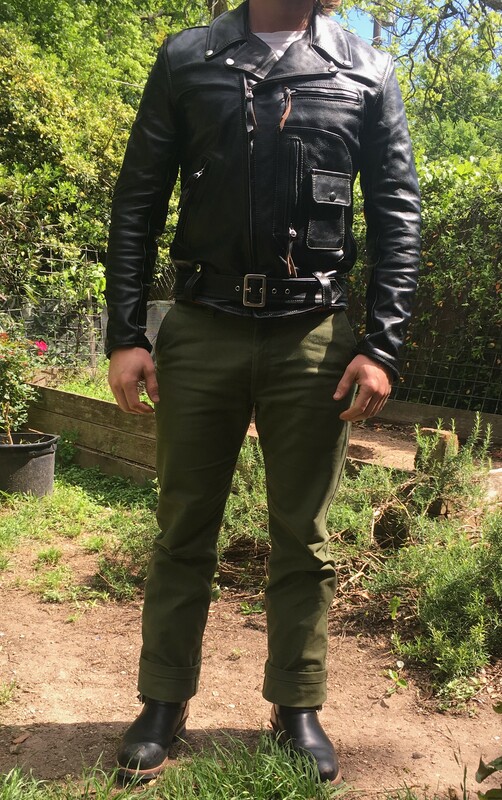 I tried to take photos with the jacket zipped/unzipped, cuffs open/closed, the collar button/unbuttoned, and in different light for comparison. Apologize for cell quality pics but thats the only option on hand. Thanks for looking, and all feedback is appreciated! Leither, barnabus, Boyo and 16 others like this. Can’t be improved upon. Put a fork in your d pocket quest. You’re done! 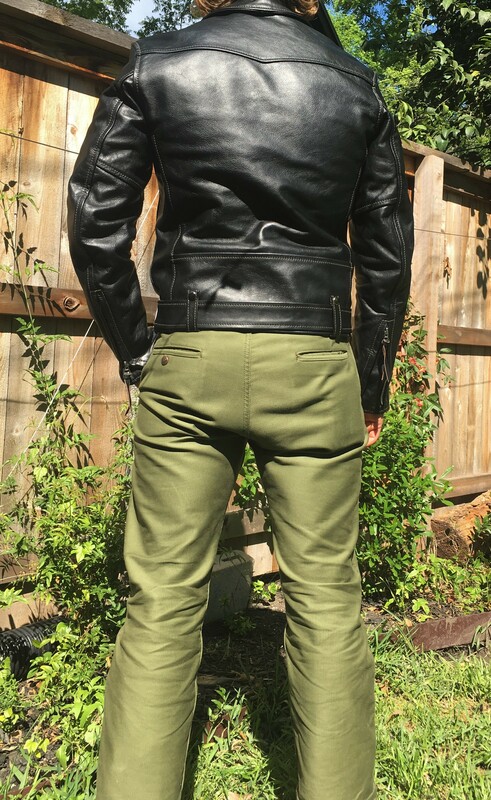 IH wip cord trousers? I like those too. Peter Bowden, VestCoast, HoosierDaddy and 2 others like this. Yep, seconded. Literally nothing you can do to improve on this, @VestCoast . Hard to find a stock jacket that fits. shoulders looks little big like 0.25", but should be fine after you break it in. You're leaning towards keeping it? With a fit like that, you'd be nuts to not keep it! Helluva nice-looking jacket. ProteinNerd, VestCoast and ton312 like this. VestCoast and ton312 like this. It looks fantastic, but I’d take off the belt. Lebowski, ton312 and VestCoast like this. 12th in line for thumbs up. Sorta jealous. Looks great. It's a keeper. Thanks! Have been admiring D-pockets from a distance for far too long, really happy to be able to put one on. The pants are indeed IH whipcord work pants, got lucky and found a pair pre-hemmed on the IH outlet in my size. I'm usually more of a jeans guy but these have really been growing on me. Thanks for the feedback everyone! I've been wearing the jacket all evening and I really like it. Even if I went full custom there isn't much I would want to change. I was a little iffy on the OD stitching, but I think I'm warming up to it. It looks good with both black and brown, so it complements the teacore nature of this leather well. 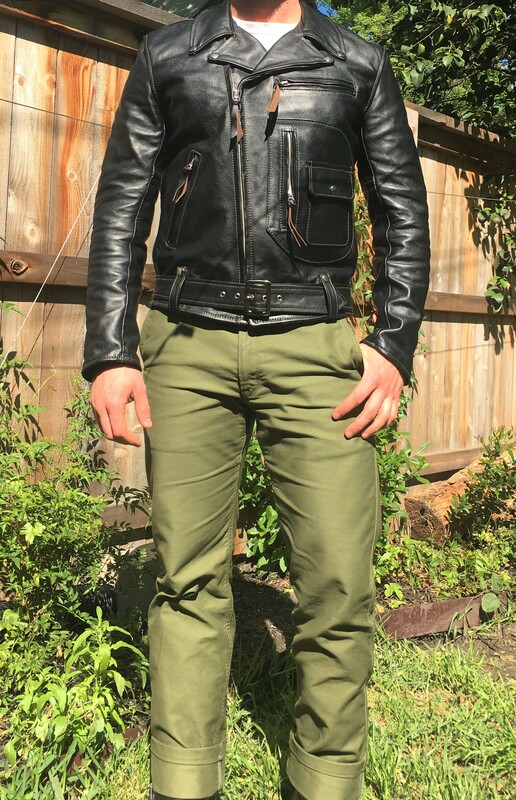 I think I will wear the jacket without the belt most of the time. I'm a fan of the belted look, but it's kind of a hassle, especially when the belt end is dangling around. Benny Holiday, Boyo and HoosierDaddy like this. Have the same jacket, great choice!! Best fit I’ve seen on a Ridley. A nice jacket with a perfect fit for you. Everything is perfect.